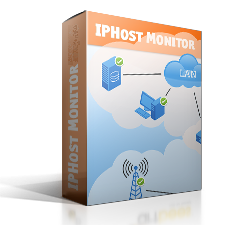 IPHost Network Monitor allows you to run external scripts and programs that calculate performance numbers and report them back to the monitoring service. You can create your own monitors of this type to perform specific tasks; you can also contact us at support@iphostmonitor.com if you would like us to write such monitors for you as a separate project. However, several such monitors are shipped with IPHost Network Monitor by default and you can utilize them as explained below. This monitor calculates the total size of all files in a directory in kilobytes. This is done by recursively scanning the directory, so the operation is time consuming and it is not recommended to run it more frequently than every 20 minutes or so; it is also not recommended to calculate the size of directories with lots of files, especially on remote hosts. You should pass the UNC or local directory name as the first parameter to this program. By default, a timeout of 10 seconds is implied for the whole operation which you can override using the -t command line switch. The last switch, -l, is used to pass credentials of a user who can read the directory contents. Since the monitoring service runs under a Local System account, it cannot access remote shared directories by default and should pass valid user credentials to access a share. You can view this plugin source code in scripts\iphost_dirsize_kb.cpp and build it using scripts\iphost_dirsize_kb.bat. Mode ‘F’ (find): the script searches for the first string occurrence in the file and returns the first number it finds after this string. The credentials string, if present, has the same format as for the directory size monitor: domain, user name, and password separated by a colon. Since the monitoring service runs under a Local System account, it cannot access remote shared files by default and should pass valid user credentials to access a share. Mode ‘C’ (count): the script counts the total number of string occurrences in the HTTP response. Mode ‘F’ (find): the script searches for the first string occurrence in the HTTP response and returns the first number it finds after this string. To determine a similar URL for your location, enter your city name at https://www.bbc.com/weather, and look at the resulting URL in the browser navigation bar. Please don’t schedule such HTTP requests too frequently; a polling interval of 1 hour should be enough in most cases.